When you opt for our Silver Package at the Chill Group in Edmonton, AB, we will prepare and file your taxes. Together with this service, we will share personalized suggestions and tips with you, we will provide you with a full set of financial statements, and we will address your concerns and answer all your tax-related questions in a Q&A session. 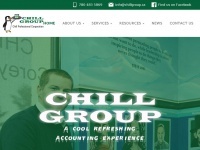 A profile of Chillgroup.ca was found on the social network Facebook. The web server used by Chillgroup.ca is run by Suite Software and is located in Anaheim, USA. The server runs exclusively the website Chillgroup.ca. The websites of Chillgroup.ca are served by a Apache web server using the operating system Ubuntu (Linux). The software used to serve the webpages was created by using the programming language PHP. For managing the data of the webpages the CMS WordPress is used. The website uses the latest markup standard HTML 5. The website does not specify details about the inclusion of its content in search engines. For this reason the content will be included by search engines.